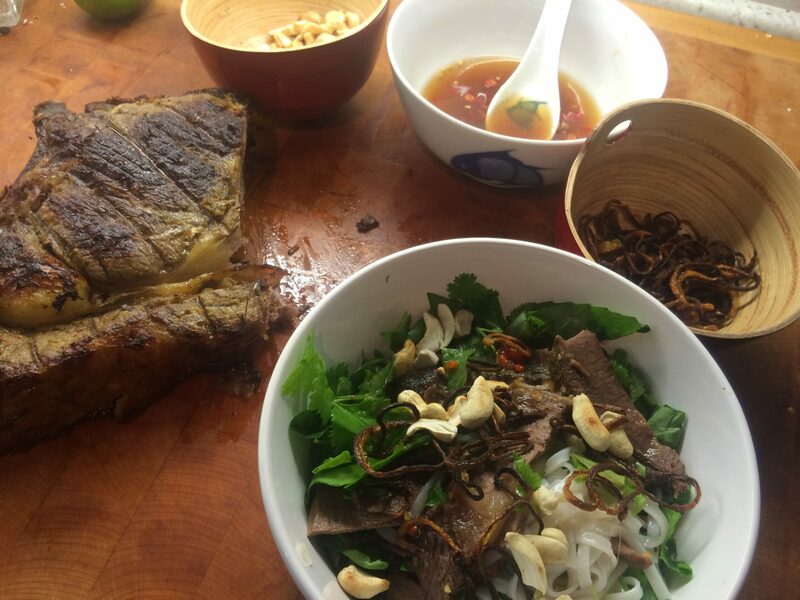 So, I’d made this Vietnamese-style noodle salad with a rib of beef, and Tweeted a picture, and Rich asked me to write a post about it for his blog. I agreed (I was quite chuffed actually but don’t tell him) and he gave me access details and then I forgot about it. 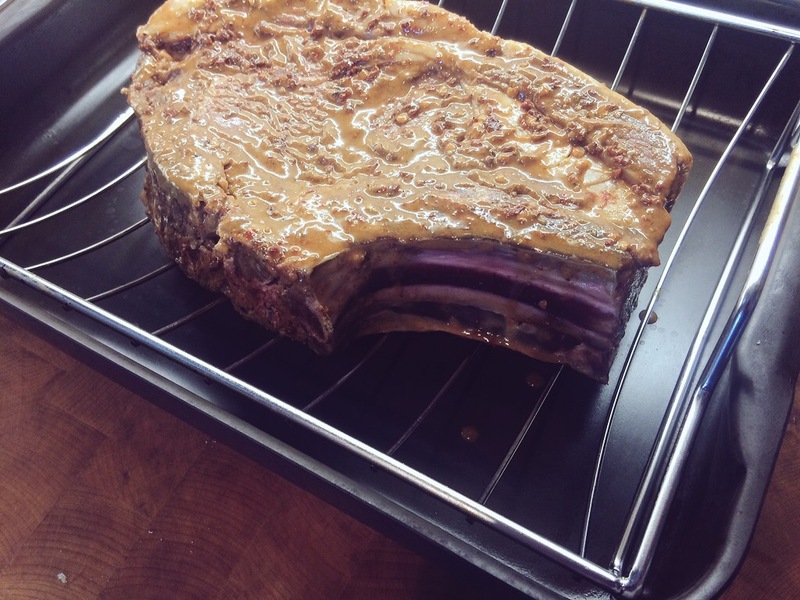 Time passed and I was in my local butcher’s shop and saw the beef ribs and I thought “I must buy that, marinate it , cook it, make the salad and then write about it for Rich’s blog.” So I did. Except for the bit where I wrote about it for Rich’s blog. But now I have. I hope that you’ll try it – don’t be put off by the ingredient list – it really is a splendid way to do something different with a decent bit of beef. Traditionally, you’d do this with steak, but this version allows for larger scale catering without the last minute meat-cooking. It’s lighter than the usual roast beef accompaniments and absolutely giddy with the fragrance, heat and pungency of nuoc mam cham sauce. Oh my, what a dressing. A glug of oil to loosen it all up, something not too strong – vegetable oil or groundnut oil. For the love of God, not olive oil. Are you reading, Jamie Oliver? Not olive oil. Where are the olive groves of the Mekong Delta? Nowhere. I don’t want to get bogged down in authenticity, but that’s a big hint about the role of olive oil in South East Asian cuisine. Sorry, I’ll crack on, shall I? Fresh rau ram, if you can find it – don’t fret if you can’t. First off, dump all the marinade ingredients into a blender and…um…blend for as long as you can stand the noise. Or if you’re feeling heroic, you can slice everything finely and then grind in a pestle and mortar. Tip onto the beef in a dish/roasting tray/ziploc bag and leave overnight in the fridge. 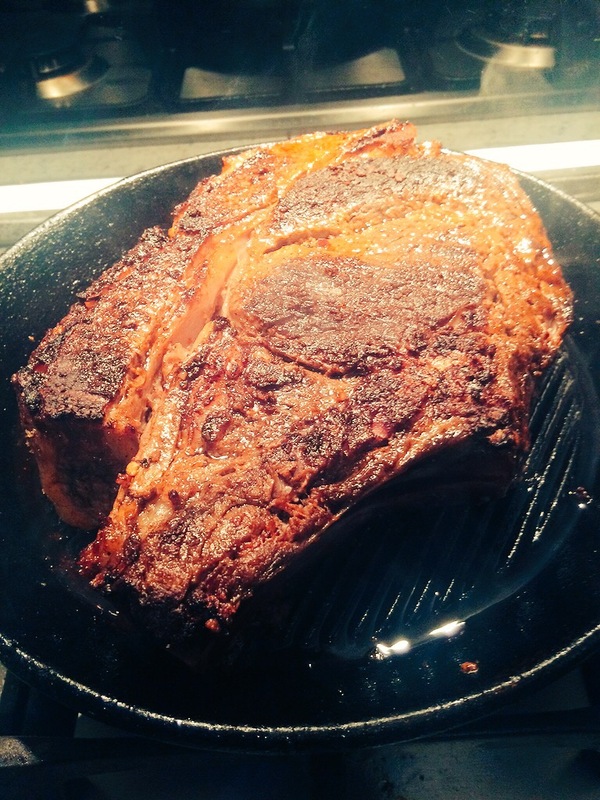 The next day get the beef up to room temperature and pre-heat the oven to 160C/fan 140C/gas 3. Scrape the meat clean of marinade and place in a roasting tin. Cook for 20 minutes per 450g for medium/ 15 minutes per 450g for rare (but see further instructions for beef below before you start cooking). On its way into the oven. To start the nuoc mam cham, put the fish sauce, vinegar and sugar in a pan with 125ml water. Stir well over a medium heat until all the sugar has dissolved. Take it up to just below boiling point and then tip it into a serving bowl to cool. Dry fry the nuts on a medium heat – keep them moving in the pan so that they don’t burn. You want them a golden brown. Don’t fret about getting an even colour all over, you’re not on Masterchef. Smash them about a bit in a pestle and mortar, nothing too fine. For the shallots, the purists will tell you to use the little pink-skinned ones you find in Asian grocers. You’ll do that once. They’re a faff to peel, so I just use banana shallots. Peel them and slice as finely and evenly as you can (evenly is the important bit here, so that the slices cook at the same rate). Wipe out the pan in which you’ve fried the nuts, glug in some oil and lay the shallots in one layer in the bottom. Once they start to pucker around the edges, get them moving and keep them moving until golden brown and crispy. It’s tricksy getting them all the same colour and texture so I’d be tempted to lift them out of the pan with a few still underdone – slightly undercooked is tolerable but a few burned ones will ruin a whole batch. Leave to drain on kitchen paper. If you’re using chilli as a garnish, slice them as finely as you can. Pick the herb leaves from their stalks, tear up the larger ones. Slice the tomatoes into eighths. Finely dice the cucumber. Finely slice the spring onion. Combine the lot in a salad bowl. Don’t get hung up on the salad ingredients – the important thing is to get a good load of leafy herbs in there. Cook the noodles according to the packet instructions and then drain in a colander. Run some cold water over them to stop them cooking. Finely chop the garlic and the chilli or run them across a microplane grater. Chillies grate pretty well from frozen. You’ll wind up with a frayed lump of red because they don’t grate that well. It’s easy to slice that bit up though. Add to the now cooled syrup you made earlier, along with the lime juice. Stir. Leave for a while and then taste. Too sweet? Too hot? Not hot enough? Too sour? Adjust to your taste. Once it’s had its allotted term in the oven, get a griddle screaming hot on the cooker. Put the extractor on. Open all the windows. Take the battery out of the smoke alarm. Wear goggles (you don’t need to, but it will make you feel all Heston). Using tongs, hold the rib upright so that the fat is against the terrifying metal. Let it have a minute or so. Then give the meat two minutes on each side to get some colour on. Put it somewhere warm to rest. Put the griddle outside now. Put the battery back in the smoke alarm. Keep the goggles, you look fabulous. If you don’t fancy all this then start the beef off with the oven at 220C/fan 200C/gas 7 for 20 minutes and then turn it down. Carve the beef into thin slices and then mouth-sized pieces. Run the noodles under cold water again if they have clagged together. Place a you-sized portion in a bowl and pile some salad on top. Mix it up. Now add beef. Garnish with crispy shallots and crunchy nuts. And chilli, if that’s your thing. Spoon over some dressing. Stir it about with a fork or chopsticks. Eat. Be happy. 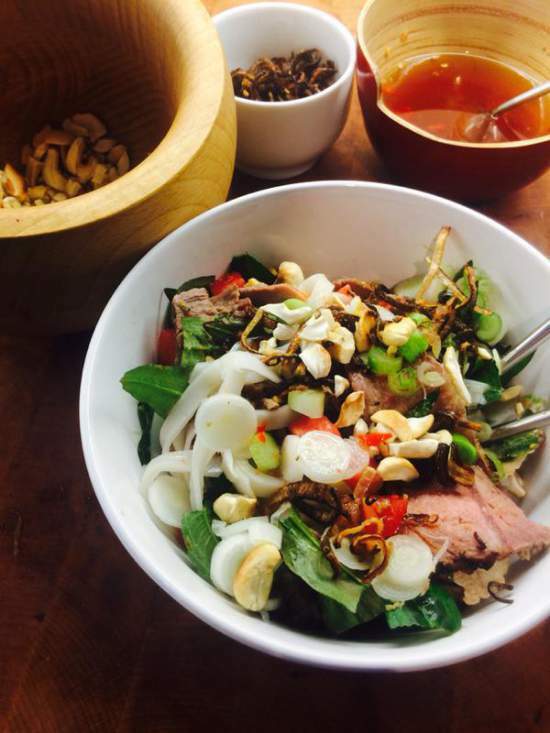 I haven’t followed a recipe for this really, except for the nuoc mam cham – that’s lifted from Luke Nguyen’s Secrets of the Red Lantern: Stories and Vietnamese Recipes from the Heart. It’s a beautiful book, written with his sister, on their family’s flight from Vietnam during the war and their new life in Australia. This book and Rosemary Brisenden’s South East Asian Food have been my guides through this part of the culinary world. You don’t have to marinate the beef at all, it’ll still taste splendid. You may be tempted by those big, firm limes, shiny as a racehorse and green as pine. Do not be led astray for they are not ripe and will yield little juice. A ripe lime is almost yellow and looks a bit done in. If you can’t find such a fruit, get some of their seductive, emerald cohorts and leave them on the windowsill for a couple of days, turning every so often. What a difference it will make. Oh yes. I use Vietnamese fish sauce – nuoc mam – Phu Quoc and Three Crabs are both good brands. You could use Thai – nam pla – instead, but it’s not as rich so perhaps up the quantity? Squid is a decent brand and it has a cool picture on the label. You could presumably use Cambodian fish sauce too, but I know nothing about it. Except its Cambodian name, prahok (and I Googled that). Thanks for letting me loose on your blog, Rich, I know that it is a very personal thing.